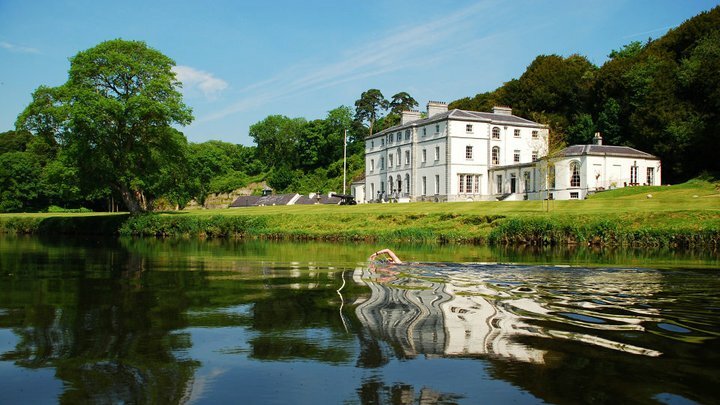 Swimmers registered at the rowing club in the morning and were taken by minibus to the gates of the Castlehyde estate, from where we enjoyed the nice walk down the wooded avenue towards the riverbank. There was a great atmosphere at the start as all of the swimmers gathered, admired the grand surroundings of the estate grounds, had photos taken with the mansion and chatted – there was a look of nervous excitement on a lot of swimmers’ faces as, for many, this would be a considerable step up distance-wise from the previous swims. After a big group photo, it was time to get everyone into the water, with a piper from a local pipe band for an added bit of atmosphere. Thankfully, us non-wetsuited swimmers, small in numbers though we were, were allowed to wait until all of the wetsuited swimmers were in the water before getting ourselves (so that we wouldn’t get cold waiting for the start)… It was an impressive sight to see all 105 bodies assembled in the river ready to take on the 3+ km swim back to town! Maeve [unsurprisingly] blitzed the course and was first home! She had a battle on her hands, though, and was followed shortly by Brian Foley (first in the male wetsuit category). After a bit of a gap, I was third home and first in the male non-wetsuit category. First in the female wetsuit category was Maeve Linehan from Mallow (so a fellow Blackwater native). All the feedback from participants was glowing: everyone seems to have thoroughly enjoyed the event and it looks like there’ll be an even bigger turnout for next year! Thanks to everyone at Blackwater Triathlon Club for organising the race, to Michael Flatley and all the staff in Castlehyde for allowing us access to the river through the property, to Fermoy Lions Club for promoting the event and making sure that it could go ahead, and to Ber Hunter for her fabulous photographs! Setting off in dribs and drabs from the riverbank just upstream from Castlehyde. The swim was a great opportunity for many to challenge themselves with their longest swim to date, which it was for most of the 15 swimmers who completed it. It was also a good opportunity for my boyfriend, Wagner, to get to grips with kayaking for a bigger group of swimmers, which it turns out mightn’t be as tough as listening to them talking about swimming! Wagner getting used to the kayak…and listening to swimmers talking about swimming! The second swim took place last Sunday. It was a little longer, at 5 km, but seven dedicated swimmers took up the challenge (that number would likely have been higher had Cork not been playing Waterford in hurling at the same time). We had plenty of safety back-up for this swim, with Wagner kayaking again, as well as Declan’s daughter Anna and one other also kayaking, and Iain MacCallum accompanying us in a boat. Again, all completed the swim and are looking forward to doing it again! Assembling on the Blackwater Sub-aqua Club slipway, just downstream of the town. Now that appetites have been wet for longer swims in the river, we may be able to get a group to try out the 7 km from Cappoquin to Villierstown, in the tidal reach of the Blackwater. From there, who knows, let’s hope that it’s just the start of great long-distance swimming culture on our great river! Growing up swimming in the River Blackwater in Fermoy during the week and in the sea at weekends, I was always fascinated by the idea of swimming from Fermoy to the sea in stages, but never really gave the idea any serious thought. 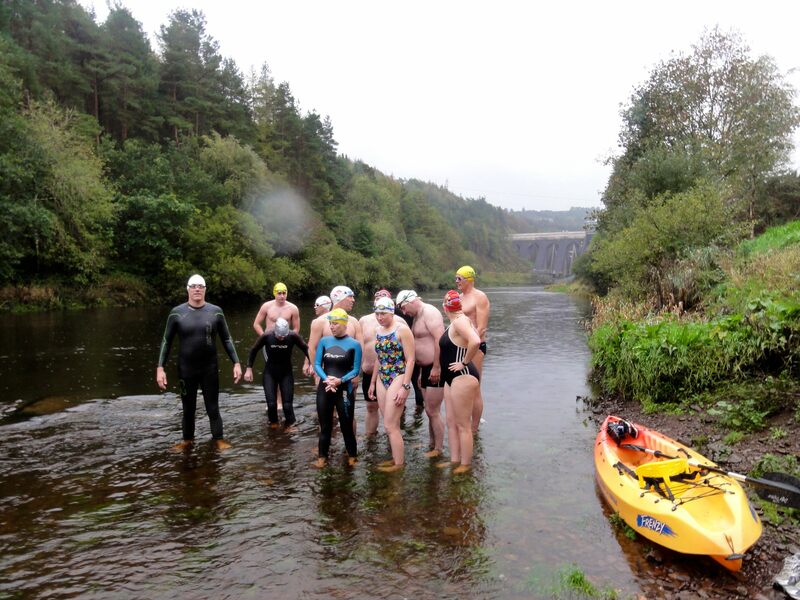 The reason for this was that, although the last 30 km of the River’s course is tidal and is sufficiently deep for both a swimmer and a support boat at high water, there is 30 km of not-so-deep water between Fermoy and the tidal limit. This 30 km has three weirs and plenty of rapids. Neither I nor anyone that I knew was familiar with the idea of swimming in the presence of such obstacles, so I put the whole notion to bed, for a while at least. However, another idea that had always interested me was to swim the 10 km downstream from Ballyhooly to Fermoy, also on the Blackwater. Having already kayaked this route, it seemed less daunting. Also, the distance was manageable, especially given the assistance from the current. Eventually, in August 2010, I convinced Ned Denison to join me for this exploratory river descent. 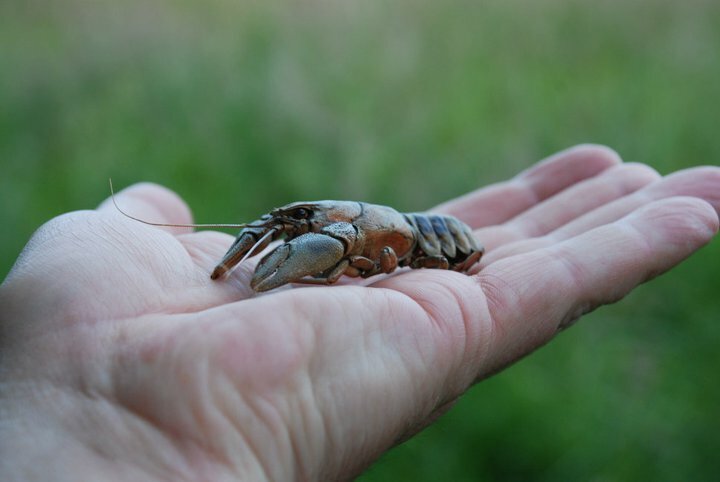 Austropotamobius pallipes – a freshwater crayfish. These are endangered but we come across them occasionally in the Blackwater. This one was found by my father at the Strand near Fermoy. The water crystal clear, very fresh and we could see lots of young trout and other fish swimming upstream. No more than 100 m into the swim, we were faced with our first set of rapids. Neither of us was quite sure how to approach it, so we both stood up and attempted to walk. Bad idea – it was almost impossible to walk over the stony riverbed barefooted, as we were, and neither of us could maintain an upright position for more than a stride or two! As we came to more rapids, our technique in traversing them gradually improved. We carried on through the countryside, passing some very bemused looking fishermen, until we came to the first recognizable feature, the infamous Poll Pádraig. This maze of island, pools and rapids marks the halfway point and is also the place where two “known priest-hunters” are said to have drowned. Next we came to Cregg Castle, where there is a good stretch of deep water. Shortly after this there are more rapids and the River is joined by Cregg Stream, which flows from Knockanannig Reservoir, another Fermoy swimming location. Luckily, I knew this area of fast water quite well so I was able to navigate the narrow channel, avoiding the need to stand and gaining some speed from the force of the water. The final set of rapids at Castlehyde is very shallow and there is no option but to stand up and walk. From here, there is a 3.5 km stretch of very familiar deep water held back by Fermoy Weir. We finished the swim back at the usual spot, exactly 2 hours 30 minutes later. Swimming past the very beautiful Castlehyde House in June 2009. Pioneers of the first “Lee Descent” swim from Inniscarra Dam to County Hall. The following year, Ray McArdle from Dolphin SC came up with the excellent idea of swimming from Inniscarra Dam to County Hall in Cork, a distance of 12 km. He contacted the ESB, who agreed to discharge a large volume of water from the Dam to make the lower part of the River Lee suitable for swimming. A dozen swimmers started the swim just below the Dam. With a strong flow, it wasn’t long before we had reached our first feed stop at Ballincollig Weir. The next feed stop was at a small gravel beach near the Angler’s Rest. Just after this point, there is a bridge, at which many of us learned the hard way that, when swimming under bridges, it is very important to look out for remnants of older bridges! We all finished back at the Lee Fields amenity car park, well inside our expected times for 12 km.